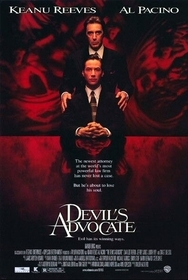 Often deceptively simple -- and isn't that appropriate -- The Devil's Advocate is one of my favorite films from 1997, and would rank at least in my top 50 for the decade. It's yet another film that I think is best approached blindly. If you haven't seen it yet, I suggest that you stop reading, watch the film, then get back to me. You just have to trust me that it's worth your time. If you ignore my advice, beware of major spoilers below. Since I'll assume that everyone still reading has already seen the film, I'll approach the rest of my review a bit differently. If read literally, a huge chunk of The Devil's Advocate is really just a lawyer film. Kevin Lomax (Keanu Reeves -- and despite the conventional wisdom on the Internet, I love his acting) is a devil's advocate in the sense that, as a defense attorney, he mostly argues stances that he doesn't hold himself. Unlike typical devil's advocate arguments, his are ethically weighty, since if his points are taken, he wins cases for defendents who are usually guilty. We can continue to read The Devil's Advocate as a lawyer film at least until Eddie Barzoon's (genre film veteran Jeffrey Jones, another one of my favorites) death, at which point trying to read it that way becomes increasingly difficult. What tends to happen at that point for someone watching for the first time is that they try as long as possible to keep reading it as a lawyer film, but there are all these quirks that are increasingly irritating and hard to account for. 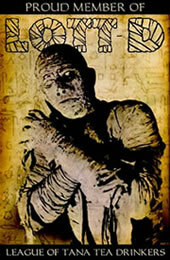 Of course, there are quirks prior to Barzoon's death as well, but most of those can be explained. The most incongruous one would be the prosecuting attorney's inability to speak during the Phillipe Moyez (Delroy Lindo, who is unfortunately uncredited in the film) trial, but that might seem like a bit of humor thrown into an otherwise serious film. If read as a lawyer film, Lomax' wife, Mary Ann (Charlize Theron), would obviously be exemplifying real insanity. Director Taylor Hackford ingeniously goes to great pains to make sure that you can continue to read her this way for the entire film. Once you realize John Milton's (the excellent Al Pacino) nature, it's clear that you really shouldn't read The Devil's Advocate as a lawyer film. Still, there may be some people who see it that way and wonder why the hell Hackford, and the writers, of course, would throw in all the Devil stuff and the supernatural effects. I suppose to them the film just seems deeply confused and seriously flawed. But "Devil's advocate" is meant more literally. "Advocate" is, as you know, also a term for an attorney. From the beginning, The Devil's Advocate is really a horror film, but a profoundly subtle one. Although it's not how we usually think of evil, Lomax is doing the same by releasing the guilty--often persons guilty of very serious crimes. For instance, we later learn from Weaver that the child molester who Lomax freed via argument was discovered with a child's body in the trunk of his car. And if you release the guilty when you know they're guilty and they go on to commit further crimes, aren't you partly responsible? Lomax isn't just fighting for the guilty because he believes that even the guilty deserve the best defense possible, or because he's a wanton, anarchic hedonist, or because he has some other alternative ethics. He's fighting because he's the Devil's advocate and more. Another brilliant move on the filmmakers' part is that it is never clear whether the bulk of Lomax' evil actions are his own doing or his father's. Sure, Milton says that Lomax has free will and he can't interfere, but is that true? Satan is the Prince of Lies, after all. On the other hand, as Satan's spawn, Lomax isn't likely to be an innocent bystander. His nature is at least partly evil. However, reading Milton's comments about free will as a deception, and seeing Lomax as mostly innocent gives Lomax' decision at the end of the film much more power--he's overcoming the influence of evil in a defiant act of free will, which understandably surprises and enrages Satan. This reading also gives the epilogue more of an impact, since the message there is basically that no matter what Lomax does, he can't escape his fate or his nature. The Devil's Advocate isn't a horror film in the vein of, say, Wishmaster, with the genie replaced by Old Scratch. Part of The Devil's Advocate's point, by being more realistic on the whole, is to question whether it isn't more evil to knowingly release evil entities on the world rather than dream up some fantasy destruction like Wishmaster. The Devil's Advocate forces you to go back and reassess what came before to make proper sense of it and make it work--but that's not a bad thing, it's just indicative of the depth and brilliance of this film. Al Pacino's character shares a name with the author of Paradise Lost. Joel Schumacher was originally attached to direct this, with Brad Pitt to star -- way back in 1994.